Beautiful composition Scott. Third outfit is our favorite. I love dc martens! The two first looks are so great! Makes me wish it was winter again (from Australia) – these babies will never go out of fashion. Agreed – I’ve been wearing them steady since 1984… boots, shoes, sandals – never ever fully out of style even when they’re not in-style, always have a classic iconic look… welcome back, hello again to docs on the street. I like the Dr.Martens boots, they give you an interesting style in your daily outfit!! Some people look great with that shoes. Are nice but I didnt wore that style. Have a nice evening. I really love outfit number 2. It looks so easy however so flawless. The red scarf certainly makes the outfit. Oh, Good job! Very beautiful pictures. I realy like the outif numbre two and the first one. They are Classic! 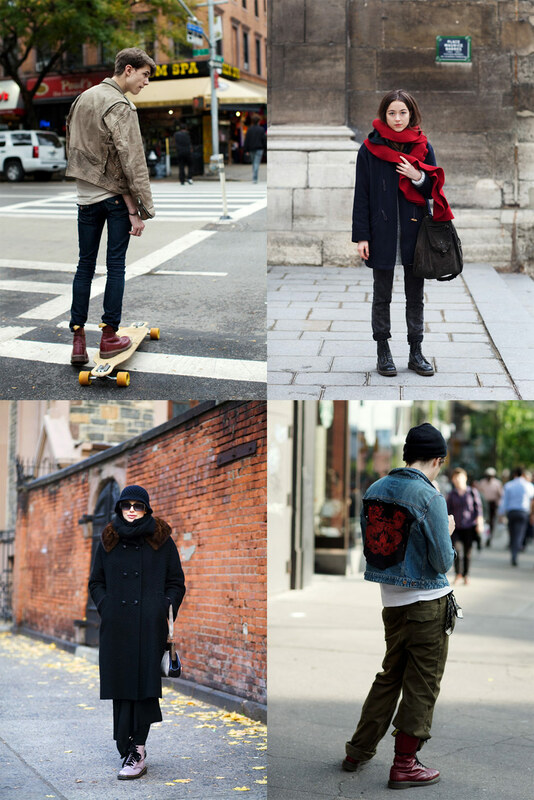 With Grunge emerging in its new and unique way on the runways for 2013…certain to see more of them on the streets! The guy with the long-board is super fly! My love for DM’s spans years! Great photos I especially like photo 2. They look very cool in the pictures !! #2 gets my vote because this outfit can be worn at any age. I would like to see more variation in skirt length. I love wearing these or my paratrooper boots with mini-dresses and shorter skirts or pretty much any skirt or dress. I can’t be alone in this. I don’t know what it is about these shoes… but I NEVER think about Doc Martens. That second shot is gorgeous though. 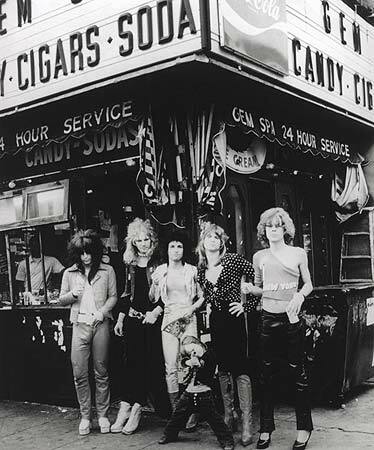 Rockin’ pics…the East Village store across the street from the skater was the backdrop of a New York Dolls photo (click my name to view). Amazing. Loved how the color of the Dr. Martens pop out on the first picture!! i cant pull them off! The first photo actually inspired me to buy my first pair of Docs a while ago when it was first posted! Most amazing shoes ever…changed the way I dress!!! I remember my first pair of Docs too…it totally opened me up to a new mood in my wardrobe and subsequently taking up 70% of my shoe closet. The super functional part about them is that the sole is perfectly thick and comfy so it makes conquering the various terrain in NYC less of an obstacle. I remember my first pair too! They were my sisters old, and a little too big( good with a pair of freshly washed fluffy athletic socks). I took them one day, and wore them all the time afterwards. I remember sticking them in the back of the closet and praying that she forgot about them when she went off to school East. Great boot inspiration…no matter what brand! My favorite is the navy and red one. Such great volume in her outfit. These are beautiful shots, I’m currently wearing my shoe version of DMs literally with everything. Classic. These days the way to go is Solovair. Same style, better shoe. I still have my docs from 1994, and I’ll never toss them! I like the sleeker styles they’ve come up with in recent years. I love the floral print Dr. Martens, they are so pretty! Nice shots. I own a pair of black Dr Martens plain welt shoes. they don’t have the distinctive yellow stitching around the sole, which makes them look less aggressive and even more minimalist. LOVE this – so reminiscent of my high school years! That’s it! I’m buying a pair…the classic black ones! I see two lovely overcoats, however punk is dead. I find the top two most stylish and eye-catching. I hope the guy (top left) is modelling if he isn’t already. Effortless style. Hmm, I’m not so sure. I say “think again”. Does everything old have to be new again? I am a firm beleiver that wearing Doc Martins will send a message that never repeats itself – depending on the wearer. I, for example am a 58 year old woman and when I wear my knee-length black boots with skinny jeans, it just looking so right. I see that it allows other woman in my age group to re-think what is “age appropriate” in terms of style choices. Great pics though! With or without docs. There is something weird about the posture when wearing Doc Martens; there is this hunched back, and a look that oscillates between indifferent and provocative. just cool and lovely at the same time! I have metallic purple ones! Love them in the Winter – no other boot can match the practicality and attitude of them. Oh, I love Dr Martens. These guys look so cool – especially the girl in top right. No. Some things should never come back into fashion. Holy moly, these outfits rock. I especially love the pink Docs! wearing Vintage 10-eye 1490 today, speaking of which. feel proud to have ’80 resurrection. Dr. Martens forever. Does anybody know where in Cape Town (South Africa) you can get Doc Martens? Perhaps I shall succumb to the lure this time, though I do usually HATE rubber soles. Loved these the first time they became popular (I was in 5th grade) but I’m not sure I can pull them off now. I do remember them being very comfortable though. Ah doccies. I had a pair of gold docs I bought from the seconds shop that I wore with everything for about 10 years until they died. A few years in mourning and now I have a pair of Liberty print docs. My feet are blissed out. My eyes are happy. The only fly in the ointment is the Australian summer. Love outfit nr2 and 4. Love Docs especially the old well worn ones. The new ones causes blisters and too stiff to walk on. I have a pair of the black and bright red ones. Love them so much! i was thinking about bringing my docs out for a spin just as i saw this post!! especially the black patent leather ones. impeccable timing! I especially like the pic of the lady with the pink ones! Remember the song that accompanied these boots first time round? Mind you I now own a very comfortable pair of slip on brown DMs. My faves – no aggro here officer. I wear my 2 pairs since decades. You cant wear them everyday though, thats too disgusting. I’m English and grew up in London. Consequently my teenage years of punk and two tone were spent almost exclusively in a Docs. To this day I still have at least one pair in my cupboard. A classic design. The other day I showed my 11yr old son a pair of ox blood 12 holes and said, “I used to have a pair of them”, to which he answered, “but dad, aren’t they girls shoes?”. I think it’s really funny how a classic clumpy working mans boot has somehow become a stylish shoe for women. I just wish they were still made in the UK. The original factory that made them still make their own version called solovair, I think they’re much nicer. hey there, i totally agree with you although i am a woman. for 10 years i was wearing only them. and now in my 30s i miss how comfortable and decent they were. Anyway heels are great but i just bought myshelf another pair for the hard days. Finally, i always believed that martens are beyond just style, they are kind like.. an idea. :-O Legs of the boy on the first photo are so skinny. So what, they are well shaped, and skinny is nice. My 13 pair strong Doc collection started with one of your photos. (Other pics also contributed to Converse collection too.) I am a teacher and I get in ‘trouble’ with my students if I wear ‘normal’ shoes! I liked them at one time, as a teenager in the 80′s, but now they seem clunky and poorly tailored. That red scarf is certainly eye-catching. I love my Docs. I have the top two pairs and still wear my first, the classic black 10-hole, at least a couple times a week. I got them in Budapest in 1997 and they have worn with just the right amount of character. They transcend fashion. I’m sure every owner has a story. I like to pair them with more expensive, preppy clothes for work. They’re a nice little touch that seperates you from the square community. Awesome. But who wears docs to skate? Lots of people. I see it all the time. Does anyone know what kind of jeans those are in the first pic.? You have to love Dr Martins, brilliant quality and it looks great! it shows: be your own kind of beautiful. they all look fab! Had two pairs years ago…and they were worn and worn to death. Since then ive had wverybtype and brand of ahoe and boot going. Huge boot fan here. Lol…But I’d forgotten how comfortable the docs were….. until recently, when I unearthed a pair of 90′s floral air wair ones. Bliss ….. it’s like walking on air… literally. I’m going to get a black pair for winter… they really are fantastic boots.